Following the success of the third conference in 2018, we are pleased to announce that the fourth Cass Mergers and Acquisitions Research Centre (MARC) Conference will be held at Cass Business School, City, University of London on Monday 19 August 2019, again in cooperation with the European Corporate Governance Institute (ECGI). The conference organizers invite authors to submit original, theoretical and empirical papers covering issues related to mergers and acquisitions (M&A), including topics such as deal structure from financing to integration, activism, regulatory changes, domestic and cross border transactions and corporate social responsibility among others. PAPER SUBMISSION: The submission deadline has been extended to Friday 12 April, 10pm GMT (United Kingdom time). There is no submission fee. To be eligible for submission, the paper must still be at a revisable stage (i.e. neither forthcoming nor close to being accepted at a journal) by the date of the conference. Please email a pdf version of your paper to CassMARC@city.ac.uk. The file name must be: [presenting author’s last name]_[shortened paper title] (for example, Smith_Deal integration.pdf). Please include “MARC2019” in the subject of your email. We expect to notify authors about acceptances by 31 May 2019. STRUCTURE: Sessions will take place between 8:30am and 5:30pm on Monday 19 August 2019 with a keynote speech during lunch and reception following the conference. The conference dinner for presenters, discussants, and program committee members will be held following the conference on Monday 19 August 2019. TRAVEL AND ACCOMMODATION: The conference organizers offer complimentary hotel accommodation near the conference venue for two nights 18-19 August 2019 for presenters, discussants, and program committee members. PROGRAM COMMITTEE: Kenneth Ahern (University of Southern California), Marco Becht (Université libre de Bruxelles & ECGI), Claudia Custodio (Imperial College), Robert Dam (University of Colorado at Boulder), Éric de Bodt (Université Lille II), B. Espen Eckbo (Dartmouth College & ECGI), Eliezer Fich (Drexel University), Andrey Golubov (University of Toronto), Jarrad Harford (University of Washington), Dirk Jenter (London School of Economics), Kai Li (University of British Columbia), Ronald Masulis (University of New South Wales), Harold Mulherin (University of Georgia), Micah Officer (Loyola Marymount University), Robert Parrino (University of Texas at Austin), Raghavendra Rau (University of Cambridge), Edward Rice (University of Washington), Stefano Rossi (Purdue University & ECGI), Henri Servaes (London Business School & ECGI), Denis Sosyura (Arizona State University), Sudi Sudarsanam (Cranfield University), Karin Thorburn (Norwegian School of Economics & ECGI). ABOUT MARC: The Cass M&A Research Centre, founded in 2008, is a breakthrough - the first time a major business school has established a focused centre for research into the global M&A industry. With its proximity to the City of London, Cass is perfectly placed to maintain close contacts with M&A bankers, lawyers, consultants, accountants and other key players. MARC is one of over 20 research centres at Cass, which consistently achieves the highest independent ratings. A number of corporations, regulators, professional services firms, exchanges and universities have been using MARC for swift access to the latest research and practical ideas. MARC is proud to have its Senior Sponsors, Credit Suisse and EY, and Sponsors, Acuris, Ardian, Intralinks and Willis Towers Watson, as research partners. In 2011, MARC was chosen by AACSB to be the 'Spotlight' feature in its Research/Scholarship Resource Center. 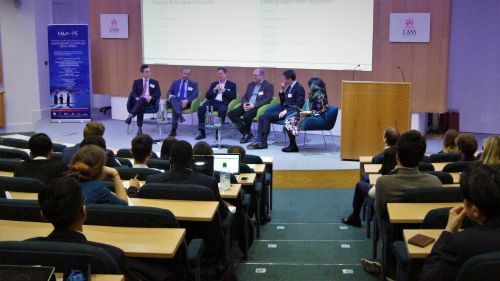 The M&A Research Centre held a panel discussion and audience debate on 30 January 2019 at Cass Business School. The ninth annual Outlook for M&A event heard predictions for the M&A market in 2019 from Cass academics, industry practitioners from MARC's sponsor organisations (Acuris, Ardian, ICAEW, Intralinks and Willis Towers Watson) and other leading companies. The Mergers and Acquisitions Research Centre (MARC) at Cass Business School in cooperation with the European Corporate Governance Centre (ECGI) held the Third Cass Mergers and Acquisitions Research Centre Conference at Cass Business School, City, University of London. Sessions took place between 8:30am and 5:30pm on Monday 20 August 2018. The keynote speech was delivered Philip Whitchelo, Vice President for Strategic Business & Corporate Development, Intralinks. The conference was attended by academics, PhD students and alumni. Read the conference report summarising each presentation. Firms may acquire innovative targets to discontinue the development of the targets' innovation projects in order to preempt future competition. We call such acquisitions \killer acquisitions." We develop a parsimonious model and provide empirical evidence for this phenomenon in drug development by tracking detailed project-level development histories of more than 60,000 drug projects. We show theoretically and empirically that acquired drug projects are less likely to be continued in the development process, and this result is particularly pronounced when the acquired project overlaps with the acquirer's development pipeline and when the acquirer has strong incentives to protect its market power. We also document that alternative interpretations such as optimal project selection, organizational frictions, and human capital and technology redeployment do not explain our results. Our conservative estimates indicate that about 7% of all acquisitions in our sample are killer acquisitions and that eliminating their adverse effect on drug project development would raise the pharmaceutical industry's aggregate drug project continuation rate by more than 5%. These findings have important implications for antitrust policy, startup exit, and the process of creative destruction. We examine how stock liquidity affects acquisitions. Relying on a simple model, we hypothesize that liquidity enhances acquirer stock as an acquisition currency, especially when the target is relatively less liquid. As hypothesized, we find that greater acquirer (lower target) liquidity increases acquisition likelihood and payment with stock, reduces acquisition premiums, and improves acquirer announcement returns in equity deals. To exploit the benefits of liquidity, firms take steps to improve stock liquidity prior to stock acquisitions. Our identification strategy relies primarily on the liquidity shock induced by stock-market decimalization. A supplementary test using the variation in stock liquidity induced by changes in composition of Russell-1000/2000 indices yields similar results. This paper examines changes in M&A activity and stock market valuations around a significant law change that increased the protection of some U.S. industries against foreign acquirers. The Foreign Investment and National Security Act of 2007 (FINSA) dramatically increased scrutiny of M&A activity by the Committee on Foreign Investment in the United States (CFIUS). The additional scrutiny increased frictions for foreign investors seeking to acquire equity stakes in a large array of U.S. industries comprising approximately one-fourth of the Compustat universe. In a difference-in-differences research design, we find that foreign takeovers of FINSA-affected firms declined by 68% relative to our control group of unaffected firms. In contrast, domestic takeovers of FINSA-affected firms, which are not subject to CFIUS review, remain unchanged. We further find that FINSA-affected firms lost 0.43% of their value on average ($151.42 billion in total market value) over a three-day window surrounding five events related to the passage and implementation of FINSA. Across the event dates examined, we find negative [positive] cumulative abnormal returns (CARs) for FINSA-affected firms as the probability and severity of FINSA legislation increases [decreases]. The change in CARs is greater for firms with higher pre-FINSA predicted probability of future takeover and for firms with a higher likelihood of financial distress. Our findings suggest that financial protectionism, manifested in increased CFIUS scrutiny of M&A activity, harms shareholder wealth through a less liquid market for corporate control. We examine the impact of creditor control rights on corporate acquisitions, using covenant violations as an indicator of heightened creditor control. We show that private credit agreements frequently impose restrictions on borrower acquisition decisions. Following a covenant violation, creditors use their bargaining power to tighten these restrictions and limit acquisition activity, particularly deals expected to earn large negative announcement returns. Firms that do announce an acquisition while in violation of a covenant earn 1.8% higher stock returns, on average, with the effect concentrated among firms with weak external governance. We conclude that creditors and equity holders share congruent preferences to limit activity motivated by managerial agency conflicts. We use proprietary data from a job search website to reveal how employees look for new jobs around mergers and acquisition (M&A) announcements. This paper documents several new empirical findings. First, we observe a significant increase in employees’ job search activity approximately five months before an M&A announcement. In contrast, abnormal stock returns for target companies only materialize approximately one month before the announcement. Second, these employees target significantly lower wages in the outside labor market relative to other job seekers in the population. Third, employees who perform tasks that are sensitive to changes in organizational hierarchies show the greatest changes in search effort. We develop a model that incorporates M&A into a job search theoretic framework in order to interpret these findings. Using novel firm-level data on employee relations in an international sample of M&A deals, we find that shareholders react positively to an acquirer’s provision of employee-friendly policies around domestic acquisitions, but negatively in cross-border acquisitions. These effects are primarily driven by the provision of monetary incentives, and cannot be explained by country-level labor regulations or by target-level employee relations, and are concentrated on the acquirer’s returns rather than the target’s returns. Our findings suggest that acquirer shareholders view treating employees well favorably, as this can potentially reduce labor adjustment costs during a firm’s reorganization, but they dislike such generous employment benefits in cross-border acquisitions when uncertainties regarding post-merger integration are high. We use mergers in the global asset management industry to study the value human capital synergies. Following mergers, the average fund rebalances towards new investment areas, creating $18 million in additional value. We relate these synergies to improvements in internal labor markets: synergies are strongest for funds with managerial changes and in mergers that increase the size and complementarity of human capital expertise. This allows for a better matching of human to investment capital and points to a central benefit of mergers: the added flexibility to create value via discretionary increases in the size and quality of internal labor markets. At the eighth Outlook for M&A event, Cass academics, industry practitioners from MARC's sponsor organisations (Acuris, Ardian, Credit Suisse and Willis Towers Watson) and other leading companies outlined their predictions for the Mergers and Acquisitions market in 2018. Baroness Morgan shared some of the lessons learnt from the merger of two charities that created Breast Cancer Now, making it the largest breast cancer research charity in the UK. "Mergers are not common in the charity sector," said Baroness Morgan. In 2015, when Breast Cancer Now formed, there were over 6000 mergers in the commercial sector compared to only 61 in the charity sector. The Mergers and Acquisitions Research Centre (MARC) at Cass Business School in cooperation with the European Corporate Governance Centre (ECGI) held the Second Cass Mergers and Acquisitions Research Centre Conference at Cass Business School, City, University of London on Tuesday, 22 August 2017. Sessions took place between 8:30am and 5:30pm on Tuesday 22 August 2017. The keynote speech was delivered Michel Driessen, Partner, UK & Ireland Head of Operational Transaction Services, EY. The conference was attended by academics, PhD students and alumni. With five percent of U.S. public firms acquired in a typical year, we show rational expectations perpetually embed a significant portion of acquisition gains into firms’ stock prices. We estimate 10% of a typical firm’s stock price can be attributed to general merger anticipation. As a result, the unobserved (anticipated) portion of the merger premium is roughly one-third of the observed premium, implying M&A event studies greatly understate the gain from mergers. Consistent with this hypothesis, announced deal premiums are strongly negatively correlated with the probability a firm will be acquired. Finally, we show a strong link from merger activity to stock prices, with each dollar of announced merger premiums associated with up to $44 of increased aggregate market valuation. The paper examines whether financially constrained firms are able to use acquisitions to ease their constraints. The results show that acquisitions do ease financing constraints for constrained acquirers. Relative to unconstrained acquires, financially constrained firms are more likely to use undervalued equity to fund acquisitions and to target unconstrained and more liquid firms. Using a propensity score matched sample in a difference-in-difference framework, the results show that constrained acquirers become less constrained post-acquisition and relative to matched non- acquiring firms. This improvement is more pronounced for diversifying acquisitions and constrained firms that acquire rather than issue equity and retain the proceeds. Following acquisition, constrained acquirers raise more debt and increase investments, consistent with experiencing reductions in financing constraints relative to matched non-acquirers. These improvements are not seen for unconstrained acquirers. Finally, the familiar diversification discount is non- existent for financially constrained acquirers. We examine whether Bilateral Investment Treaties (BITs) remove impediments to foreign investment by helping enforce contracts and protecting the property rights of foreign investors. We find that BITs have a large, positive effect on cross-border mergers. The probability and dollar volume of mergers between two given countries more than doubles after the signing of a BIT. Most of this increase is driven by capital flowing from developed economies to developing economies, shedding light on the long-standing Lucas Paradox as to why most cross-border capital still flows to developed countries. Additionally, most of our results are driven by target countries with “medium” levels of political risk, consistent with popular views that BITs are ineffective for countries with very high risk and not necessary for countries with low political risk. Cross-border merger activity is growing in importance. We map the global trade network each year from 1989 to 2014 and compare it to cross-border and domestic merger activity. Trade-weighted merger activity in trading partner countries has statistically and economically significant explanatory power for the likelihood a given country will be in a merger wave state, both at the cross-border and the domestic levels, even controlling for its own lagged merger activity. The strength of trade as a channel for transmitting merger waves varies over time and is affected by import tariffs cuts, Euro, EU, EEA, and WTO entry. Overall, the full trade network helps our understanding of merger waves and how merger waves propagate across borders. If opportunistic acquirers can buy targets using overvalued shares, then there is an inefficiency in the merger and acquisition (M&A) market: The most overvalued rather than the highest-synergy bidder may buy the target. We quantify this inefficiency using a structural estimation approach. We find that the M&A market allocates resources efficiently on average. Opportunistic bidders crowd out high-synergy bidders in only 7% of transactions, resulting in an average synergy loss equal to 9% of the target’s value in these inefficient deals. The implied average loss across all deals is 0.63%. Although the inefficiency is small on average, it is large for certain deals, and it is larger when misvaluation is more likely. Even when opportunistic bidders lose the contest, they drive up prices, imposing a large negative externality on the winning synergistic bidders. We document that firms in the constituencies of powerful U.S. politicians that oversee antitrust regulators receive favorable mergers and acquisitions antitrust review outcomes. To establish identification, we exploit a subset of politician turnover events that are plausibly exogenous as well as a falsification test using powerful politicians with no jurisdiction over antitrust regulators. Politician incentives to influence merger antitrust review outcomes appear to be driven by lobbying, contributions, and prior business connections. Our findings suggest that merger antitrust reviews are not independent of self-serving political intervention. Title: "Product Market Dynamics and Mergers and Acquisitions: Insights from the USPTO Trademark Data"
Using a large and unique trademark-merger dataset over the period 1983 to 2016, we show that companies with large trademark portfolios, newer trademarks, and fast growth in trademarks are more likely to be acquirers, while companies with newer and more focused trademarks, and slower growth in trademarks are more likely to be target firms. Further, firms with overlapping product lines as captured by trademark similarity are more likely to be merged and these deals are associated with high combined announcement period returns. Post-merger, merger partners with overlapping product lines cancel more trademarks as well as to register fewer new trademarks, and are associated with lower costs of goods sold, lower advertising expenses, higher return on sales, and larger market shares. We conclude that eliminating product market competitors is an important driver of acquisitions. 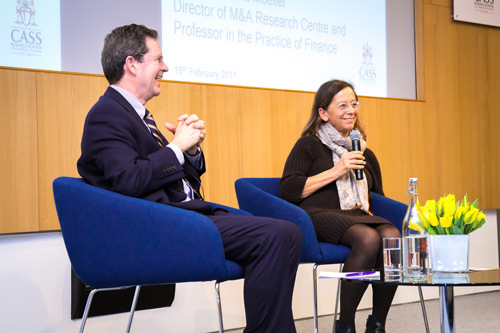 On Tuesday 14 March 2017 the Cass PE and M&A Society hosted the 2017 Annual Cass PE M&A Conference at Cass Business School. The event focused on External Risks (regulatory changes, European elections, ‘Trump’, ‘Brexit’) and Internal Risks (due diligence, cyber security, post-merger integration). At the seventh Outlook for M&A event, Cass academics, industry practitioners from MARC's sponsor organisations (Ardian, Credit Suisse, EY, Mergermarket, and Willis Towers Watson), other leading companies and top financial journalists outlined their predictions for the Mergers and Acquisitions market in 2017. The Mergers and Acquisitions Research Centre (MARC) at Cass Business School in cooperation with the European Corporate Governance Centre (ECGI) held the inaugural Cass Mergers and Acquisitions Research Centre Conference at Cass Business School, City, University of London on Monday, 22 August 2016. Sessions took place between 8:30am and 5:30pm on Monday 22 August 2016. The keynote speech was delivered during lunch by Alan Giles, senior board member of the UK Competition and Markets Authority, also a board member of a FTSE 100 company. The conference was attended by academics, PhD students and alumni. We examine the importance of merger integration risk to the outcomes of mergers and acquisitions using new product-based ex ante measures of integration risk at the firm and firm-pair level. Our ex ante measures are significantly associated with ex post statements by managers in their 10-K indicating difficulties with merger and acquisition integration and also employee retention issues. We find that firms performing mergers and acquisitions in high product integration risk markets experience lower ex post profitability, higher ex post expenses, and a higher propensity to divest assets. Upon announcement, acquirers experience lower announcement returns and targets experience significantly higher announcement returns when product integration risk is high. Examining long-term stock market returns, we find that the well-known anomaly that acquiring firms have lower longer-term stock returns primarily occurs in markets where product integration risk is high. We provide the first evidence on value creation in acquisitions by private operating _rms. Private bidders experience 16-20 per cent greater operating performance improvements following acquisitions than do public bidders. This difference is not due to differences in target types, merger accounting, financing constraints, private equity ownership or subsequent listing of some private bidders. Further analysis of governance arrangements allows us to attribute this effect to lower agency costs/better incentive alignment in private firms. Overall, not only do private firms pay lower prices for target firm assets, they also operate them more efficiently. This paper studies the deterring effects of anti-takeover provisions on takeovers and identifies the channels through which they create or destroy value for firms, as well as for the economy as a whole. We provide causal estimates – that also deal with the endogenous selection of targets – showing that voting to remove an anti-takeover provision increases the probability of a takeover by 4.5% and leads to a 2.8% higher-than-expected premium, the latter resulting from increased competition for less protected targets. We also find evidence of net value creation in the economy as stemming from more related acquisitions and targets being matched to more valuable acquirers. Shareholders’ updated valuation of internal slack reveals their revised assessment of potential agency conflicts. We study how the value of internal cash changes following state antitakeover regulation events. After carefully addressing the critiques of such experiments, we find that the value of cash increases following antitakeover law implementation, but there is considerable heterogeneity in how the value changes. Firms more susceptible to quiet-life agency problems show no increases in the market-assessed value of internal slack. Conversely, cash appreciates in companies where takeover protection helps bond important commitments with major counterparties. These findings hold across different measures of antitakeover protection events. This paper provides one of the first large sample studies documenting a positive causal effect of shareholder approval in corporate decision making. Using a hand-collected sample of U.S. mergers and acquisitions (M&As) that involve all-stock payment over the period 1995-2015, we examine whether and how the requirement of shareholder approval affects deal quality. Our identification strategy relies on listing rules of the NYSE, AMEX, and NASDAQ that shareholder approval is required when an acquirer intends to issue more than 20% new shares to finance a deal. We examine acquirer price reaction to deals in which acquirers intend to issue either above or below the 20% threshold by a small margin. The regression discontinuity design works well in all-stock deals due to acquirer management’s inability to precisely manipulate share issuance and thus provides a clean causal estimate of the effect of shareholder approval on M&As. We find a large and significant 4.3% jump in acquirer announcement returns at the 20% threshold. We further show that this positive value effect is concentrated among acquirers with more effective shareholder monitoring and among acquirers buying target firms with more severe information problems. We provide some suggestive evidence on the underlying economic mechanisms behind this positive value effect: The requirement of shareholder approval commits acquirer management to seek deals with larger synergies and strengthens its bargaining position vis-à-vis target management. Finally, we show that shareholder approval leads to better post-merger operating performance in acquirers with high institutional ownership. We conclude that the requirement of shareholder approval is effective in addressing agency problems. Shareholder voting on corporate acquisitions is controversial. In most countries acquisition decisions are delegated to boards and shareholder approval is discretionary, which makes existing empirical studies inconclusive. We study the U.K. setting where shareholder approval is imposed exogenously via a threshold test that provides strong identification. U.K. shareholders gain 8 cents per dollar at announcement with mandatory voting, or $13.6 billion over 1992-2010 in aggregate; without voting U.K. shareholders lost $3 billion. Multidimensional regression discontinuity analysis supports a causal interpretation. The evidence suggests that mandatory voting imposes a binding constraint on acquirer CEOs. A commonly held belief is that better informed large shareholders with greater influence improve corporate governance. We argue that this may not be true in general and demonstrate our argument in a model of corporate takeovers. We show that a large shareholder’s ability to collect information and trade ex post may cause him to prefer, ex ante, managers who pursue risky takeovers, even if such takeovers generate a negative expected return. We test the model’s main predictions regarding institutional investors’ trading around corporate takeovers. Consistent with the model, we find that institutional investors increase their holdings in firms that subsequently pursue acquisitions with greater performance variability and that following takeover initiation, institutional trading positively correlates with long-run deal performance. We further document that these trading patterns are more pronounced when the institutional investor has larger initial holdings of acquirer shares, when the acquirer accounts for a larger fraction of the institution’s portfolio, and when the institutional investor demonstrates better trading ability prior to acquisitions. Overall, our study sheds light on the limits of relying on better informed large shareholders to improve corporate governance. We examine the stability and composition of acquirer boards around mergers and the director characteristics associated with selection for the post-merger board. Our results indicate that the post-merger board changes substantially and variation is significantly different from both non-merger years and non-merging firms. Adjustments reflect firms upgrading skills associated with executive and merger experience and bargaining between targets and acquirers, rather than agency motives. Conversely, director selection at non-merging firms is driven by general skills and diversity. Our analyses provide insight into the dynamic nature of board structure and characteristics valued in the director labor market. Please click here for the full article and audio recording of the discussion. A panel of industry experts outlined their predictions for the Mergers and Acquisitions market in 2016. It was unanimously agreed that 2015 was an exceptional year for Mergers and Acquisitions, but now the market’s confidence is wavering in the face of uncertainty around global issues said expert panellists at the sixth annual Outlook for M&A event. More than 100 professionals, journalists and students attended the breakfast briefing organised by the M&A Research Centre (MARC) at Cass Business School, City University London to hear an analysis of the latest trends and developments. The event was introduced by the Director of MARC, Professor Scott Moeller, and presided over by Susan Kilsby, Chairman of the MARC Advisory Board. Buy Out, Sell Up or Sell On? On Wednesday 30th September 2015 the Cass Mergers & Acquisitions and Private Equity Societies hosted the 2015 Annual Cass PE M&A Summit at Cass Business School. The event highlighted the contrasts and comparisons between Private Equity and Strategic M&A in Europe, and the competitive tensions and advantages between financial and trade buyers in M&A. Representatives from Credit Suisse, White & Case, AHV Associates, and Ardian Investments offered insight into a variety of topics, including recent changes and trends in the M&A environment, industry outlook, and the strategic positioning of firms vs private equity buyers. Keynote speeches were delivered by Elias Korosis (Partner Hermes GPE), Iain Bannatyne (KPMG), and Michael Llewelyn-Jones (WCIB) with closing comments by Professor Scott Moeller (Cass Business School). Main sponsors of the event were the Worshipful Company of International Bankers and Intralinks. When thanking the sponsors of the event, M&A Society President Sven Garas noted “We would also like to thank the support of the M&A Research Centre, together with its Senior Sponsors Ardian, Credit Suisse, EY and White & Case and Sponsors Mergermarket and Towers Watson”. The event was open to both students and industry professionals. Over 250 people attended during the course of the summit meaning it continues to be the largest student-run M&A event in Europe. The fifth annual Outlook for M&A event attracted its largest ever audience, who heard predictions for the M&A market in 2015 from Cass academics, industry practitioners from MARC's sponsor organisations (Ardian, Credit Suisse, EY, Mergermarket, Towers Watson and White & Case), other leading companies and top financial journalists. The M&A Society, in conjunction with the M&A Research Centre, were delighted to welcome Sir Christopher Gent, Chairman of GlaxoSmithKline, to an evening event on 18 November 2014 at Cass Business School. He shared his wide experience of business after which there was a Q&A session, chaired by Professor Scott Moeller, Director of the M&A Research Centre. The new Chairman of the Financial Conduct Authority examined the critical importance of effective conduct financial regulation as we enter a post-crisis period of economic recovery. John Griffiths-Jones became Chairman of the new Financial Conduct Authority in April 2013, and Chairman of its subsidiary, the Payments System Regulator in April 2014. He had previously joined the Financial Services Authority Board as a Non-executive Director and Deputy Chairman on 1 September 2012. Mr Griffith-Jones worked at KPMG from 1975 to 2012, spending eleven years in Audit and 15 years in Corporate Finance before becoming CEO of KPMG's UK firm and, subsequently, Chairman and Senior Partner for the UK in 2006. In 2007, John became Joint Chairman of KPMG Europe. He is currently Vice Chairman of the National Numeracy Trust, whose role is to promote numeracy across all parts of society, a Council Member of Heart of the City and sits on the Advisory Board of the Cambridge Judge Business School. He studied Economics at Trinity Hall, Cambridge. He was the Chairman of the Every Child a Chance Trust, a special purpose charity which completed a major project, in collaboration with the Government, on numeracy in primary schools. Lesley-Anne Alexander, CBE (CEO, Royal National Institute of Blind People): Charity mergers - a happy marriage or living in sin? 2 million people in the UK suffer from a serious sight problem and every day 100 people hear the doctor's diagnosis "I'm very sorry there is nothing more that we can do to save your sight". With more than 700 UK charities having "sight loss" in their registered objects you might think that blind and partially sighted people are well supported and have their needs met. However estimates show that we only reach one third of the UK's sight loss population. So what is the answer - more competition or better collaboration? Are charities part of the problem or part of the solution? RNIB, under the leadership of Lesley-Anne Alexander CBE, has grown over the past decade through mergers with more than ten other charities for blind people and she discussed these mergers; a case study written at Cass about one of those mergers was made available to sighted, blind and visually impaired participants. Coverage of the event appeared on civilsociety.co.uk and in Third Sector. M&A deals have a greater chance of success if acquirers move quickly to install a new leadership team at the target firm, a new study by the M&A Research Centre shows. Our research, which reveals a series of fresh insights into improving returns from M&A deals, found higher rates of deal success among acquirers which rapidly appointed a top team at the target while retaining a large proportion of the operational staff. The study examined a sample of 70 large transactions completed by US and UK acquirers between 2007 and 2011, comparing those which were successful in creating shareholder value with a matched sample of those where shareholder value was destroyed. and Q&A from the audience. Dr Lynch, long been regarded as a visionary figure within the technology world, was recently voted the most influential person in UK IT in the 2011 UKtech50, and in November 2012 was presented with the 'Outstanding Contribution to UK IT' award by The British Computer Society. He was named the Confederation of British Industry's Entrepreneur of the Year 1999, the European Business Leaders Awards' Innovator of the Year 2008 and Management Today's Entrepreneur of the Year 2009, as well as holding an OBE for Services to Enterprise. He holds a number of advisory and board roles in the venture capital industry and currently serves as a non-executive director of the BBC, Blinkx plc, Featurespace Ltd and the Foundation of Science and Technology, as well as a trustee of the British Library. Dr Lynch is also a fellow of the Royal Academy of Engineering and a Lady Margaret Beaufort Fellow of Christ's College, Cambridge. The M&A Research Centre celebrated its fifth anniversary with a fascinating insight into the run-up to one of the most interesting and headline-generating M&A events of recent years - the takeover of Cadbury plc - followed by a champagne reception with M&A professionals, Cass academics and students. Sir Dominic Cadbury was the last member of the Cadbury Family to lead Cadbury Schweppes plc prior to the company being split up and in 2009 Cadbury plc becoming the subject of the most controversial takeover in recent times. Drawing on the book 'The Chocolate Wars' written by his cousin, the author Deborah Cadbury, Sir Dominic discussed the events leading up to the takeover, the issues it raised and assessed the recent record of Cadbury under the ownership of Kraft, now Mondelez International. Sir Dominic Cadbury was Chief Executive and then Chairman of Cadbury Schweppes plc between 1983 and 2000. He was Chairman of the Wellcome Trust between 2000 and 2006. He has been Chairman of The Economist Group and served on the Boards of Guinness plc, EMI plc and Misys plc where he was Chairman. He was a member of the President's Committee of the CBI and Chairman of the Food & Drinks Federation. Currently, Sir Dominic is Chancellor of the University of Birmingham. He was knighted in the Queen's Birthday Honours List in June 1997. More than 100 professionals, journalists and students attended the Third Annual Breakfast Briefing held by the M&A Research Centre (MARC) at Cass on 8 February 2013 to hear an analysis of the latest trends and developments in the M&A market from a panel of industry experts introduced by the Director of MARC, Professor Scott Moeller, and chaired by Susan Kilsby, Senior Adviser and former Chairman of M&A for Europe, the Middle East and Africa at Credit Suisse and Chairman of the MARC Advisory Board. As has become tradition, the panel discussion commenced with a round-up of the M&A activity from the past year. Hamilton Matthews, CEO of Mergermarket, gave some interesting insights into the highs and lows of the global market, mentioning that 2012 was the second lowest year on record for M&A activity globally, with the corresponding amount of PE activity at its lowest on record. However, he did identify some positive pockets of recovery, e.g. M&A activity in the UK was up 20% on the previous year. "We also continue to see growth in Asia, especially in China, where many target companies are being picked up by US buyers," he added. Stuart Upcraft, Managing Director of M&A at Credit Suisse, was cautiously optimistic about the outlook for M&A in 2013. "We have seen the US pick up, and that tends to be a leading global market indicator by about six to twelve months. Continued stable and positive equity markets should also help towards improving management confidence and, therefore, M&A activity." However, by way of caution he added that "the positive momentum from the last quarter of 2012 which has been followed by several announced large deals in early 2013 needs to be weighed against the current level of scrutiny of M&A transactions. This scrutiny comes from all directions including politicians and regulators as well as non-executives, shareholders and the financial press, and this has had a dampening effect on sentiment and management's ability and willingness to execute deals." As an example, Anousha Sakoui, M&A Editor at the Financial Times, brought up the news of accelerated talks of a potential buyout of EE, the UK's largest mobile phone operator, which had broken in the FT the day before. "The story was one of the most read articles for the day on FT online, which shows just how much interest there really is around M&A in the global business community," she said. The panel discussed the possibility of this increased scrutiny becoming a permanent fixture for deal-making or whether media coverage could be expected to return to its pre-crisis level as the global economy recovers, with the consensus leaning to the former. While the experts agreed that despite the number of large transactions recently announced, including the buyout of Dell and the potential buyout of EE, the PE industry is only just starting to recover from a prolonged trough and that we might never see the debt levels available during the 2006-2007 boom again. Robin Jowitt, M&A Partner at Ernst & Young, commented "We are seeing the PE industry returning to value creation through operational excellence, rather than financial engineering, which was prevalent during the last boom." Steve Allan, Director of Towers Watson's International Consulting Group and Practice Leader for the company's M&A team in Europe, added "We [Towers Watson] are seeing an increased interest from PE buyers in HR issues, an indicator that the operational and 'soft' sides of businesses are high on the PE agenda." The panel gave their views on the role of regulation in M&A, an issue which continues to drive activity. "Regulation is a double-edged sword for M&A activity," said Hamilton Matthews. "In a recent survey conducted with E&Y, we found that managers rated regulation as one of the most important drivers of M&A activity but at the same time regulation was also rated as top of the list of issues which hamper M&A activity." Last year's discussion around emerging market targets and buyers continued in this panel session with the experts giving some interesting views. Jowitt commented "It is an interesting question really. Is it easier for a Chinese buyer to come here to buy the skills, technology, know-how and brands they need to continue the country's rapid development or is it easier for a developed market player spread the IP by expanding in the China?" Upcraft added "Chinese companies come here to buy 1) natural resources, 2) technology and 3) brands, so yes, there is an opportunity for developed market sellers. But we continue to see cultural differences as a major driver behind failed cross-border deals." Sakoui developed the theme further, commenting that "Infrastructure will be another interesting sector in this discussion. Investments are necessary in both Europe and the US, but as we all know, capital is scarce. Emerging market buyers can fund this gap; the question is, of course, if politicians on either side of the Atlantic will accept them as investors. In general, politicians continue to be interested in M&A, so much so that some bankers now think it is necessary to get more involved in that aspect of deals and feel they need to be more in touch with political sentiment when advising clients." Allan added "Privatisation is also a growing trend, especially in the Eurozone, so we will now see politicians on the sell-side of transactions. We are also seeing a trend of unions becoming more sophisticated and becoming a stronger voice in M&A negotiations." Sakoui further mentioned that "Although the UK Takeover Panel is generally happy about the effects of the changes made in 2010 to the UK Takeover Code - notably the halved number of deals which leaked to the press before announcement in the UK - they have mentioned clarity around future business plans, including possibly employment cuts, from acquirers at the time of the announcement." In response to questions from the audience, the panel suggested that the hot sectors for M&A in 2013 were Industrials, TMT, Consumers and Energy & Mining. The US and Eastern Europe were singled out as regions which were either expected to drive M&A (the former) or as an interesting one to watch (the latter). The evening started off by exploring M&A news reporting and how Mergermarket tracks a deal from rumour to press release. The focus then turned towards deal services and IntraLinks' role in facilitating information sharing and collaboration. The third segment presented the role of investment banks, how sell-side and buy-side transactions differ and the transaction process. Finally, students were introduced to major legal issues involved in M&A deals. The event was concluded with networking and refreshments. Investment decisions, whether for capital projects or company acquisitions, are presented to boards, shareholders, employees and other stakeholders as driven by clear financial and strategic processes. The approach to these decisions appear to be rational and the decision-makers dispassionate. Increasingly, however, research shows that human behavioural factors drive the decision process, with behavioural economists and even traditional psychologists weighing in with their research showing that decision-making in the business and financial arenas parallels personal decision-making. In this very successful two-day meeting, presenters considered how the fields of behavioural finance, economic psychology and other related areas can explain more clearly what happens in investment decisions at all levels of business, but with a particular focus on corporate finance issues in large investments such as foreign direct investments, company acquisitions and mergers. The cross-border element is particularly interesting as it incorporates the additional complexities of culture and regulation, to note just two factors. The significant behavioural and psychological drivers to these deals were discussed and debated. Each year the Cass M&A Society, in conjunction with the M&A Research Centre, hosts what is now the largest student-led M&A conference in the world. 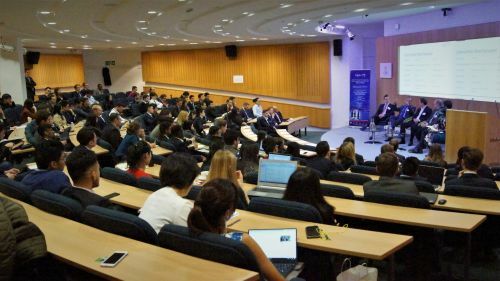 The conference presented one of the cornerstones of global finance to delegates by creating a space for dialogue and debate between dealmakers and industry leaders, whilst simultaneously maintaining its position as the largest student-led M&A gathering in the world and promoting Cass as having the leading faculty of finance in M&A. The key focus of this year's conference was M&A in emerging markets. It began with an introduction by the Deputy Dean of Cass, Professor Steven Haberman, followed by a keynote speech by Ken Costa, ex-Chairman of Lazard International, and two 45-minute panel discussions chaired by Professor Scott Moeller, Director of the M&A Research Centre at Cass, and Charles Packshaw, Head of UK M&A, HSBC. 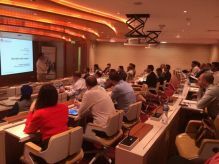 The Mergers & Acquisitions Society in conjunction with the M&A Research Centre invited EMBA students interested in corporate finance and M&A to an exclusive corporate finance workshop from 6.15 to 9 pm on 30 May 2012. Markus Duschat of Siemens AG hosted this corporate finance workshop which is exclusively for EMBA students. Markus currently works in Corporate Finance, Audit, Transaction Support for Siemens AG in Munich, and is globally responsible for providing advice on the execution of mergers and acquisitions. The event covered company structure and recent transactions, the deal process at Siemens (transaction phases and the role of CF, A, TS), the purpose of financial due diligence (valuation, enterprise vs equity value and integrated report), a case study and post-merger integration. 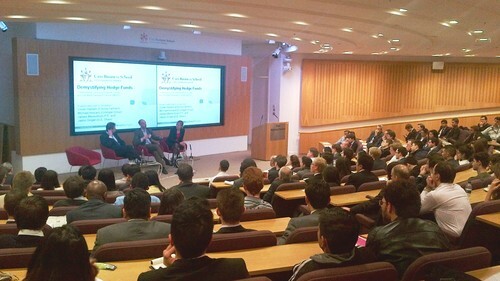 The Mergers & Acquisitions Society in conjunction with the M&A Research Centre hosted its third event, Startup Success: The Story of Mergermarket on 23 May 2012. Giovanni Amodeo, Mergermarket's Global Editor-in-Chief, spent the evening discussing the inspiring history of the company, including how it started and how it has grown at such tremendous pace. Giovanni also addressed other key topics related to the field of M&A and closed with a Q&A session. 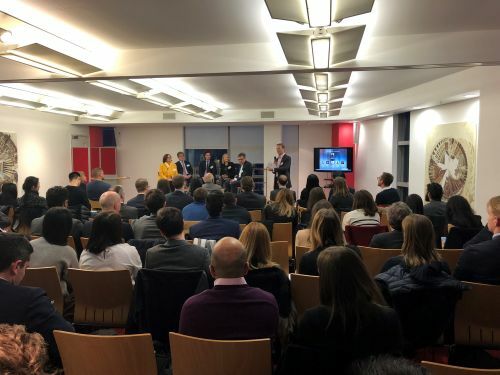 The Mergers and Acquisitions Society in conjunction with the M&A Research Centre hosted its second event, an evening focused on alternative career paths in M&A. During this event, the M&A Society and MARC presented just some of the numerous career options on hand for those with a genuine interest in the world of mergers and acquisitions. An investigation into the latest developments in the technology sector. We examined recent developments in the technology sector and analysed its recent success, with big money deals and countless record breaking IPOs. The Mergers & Acquisitions Research Centre and the student-led M&A Society co-hosted an evening event on 6 March which focused on the technology sector, looking at internet stocks and technology companies which have recently had IPOs at colossal figures, prompting worries that we may be heading into another tech bubble. Proceedings began with Professor Scott Moeller, Director of the M&A Research Centre, who introduced the M&A Society and started the evening off. Ken Goldsbrough from Greenhill then took to the podium as the first speaker. With substantial experience in debt advisory and restructuring, he provided a view into the debt side of TMT transactions. The expertise of Robert Koenig, Managing Director of HSBC's Technology, Media and Telecoms team, and formerly of Nomura and Deutsche Bank, was then drawn upon. 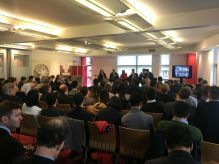 The Mergers and Acquisitions Research Centre (MARC) and the Cass Finance Society co-organised a very successful and well-attended evening event on the topic of hedge funds. Practitioners explained the workings of the industry and gave examples of trading strategies. Anna Faelten from MARC presented a recent study on M&A event trading and the evening concluded with a panel discussion on the ability of hedge funds to hedge, chaired by James Mackintosh of the Financial Times. The presentation slide deck is available by request from CassMARC@city.ac.uk. Facebook's IPO, reportedly valued at $100bn, could trigger a revival in the dormant European M&A market, according to Giovanni Amodeo, Global Editor in Chief at Mergermarket. "The current positive sentiment in the IPO market, inspired by the Facebook deal, could well have a spill-over effect on M&A activity," he added. However, fellow panellist Professor Scott Moeller, Director of the M&A Research Centre (MARC) at Cass Business School, disagreed because that deal had been anticipated for so long. "We need to have an unexpected positive event in the markets," he said, referring to the Glencore/Xstrata deal also as one that the market had been anticipating for some time and therefore not likely to have been the catalyst. Stuart Upcraft, Co-Head of UK Investment Banking at Credit Suisse, thought that the M&A market would be stronger in the second half of the year. "The M&A market tends to lag behind equity markets," he said. These market insights were shared during the annual M&A outlook event held by MARC on 3 February 2012 in London. More than 80 professionals, including almost a dozen journalists, attended the breakfast briefing to hear an analysis of the latest trends and developments in the M&A market from a panel of industry experts. The panel's Chairman was Susan Kilsby, Managing Director and Chairman of M&A for Europe, the Middle East and Africa at Credit Suisse and Chairman of the MARC Advisory Board. She was joined by Robin Jowitt (Partner at Ernst & Young), Amodeo, Moeller and Upcraft. While the experts remained downbeat about the overall outlook for Europe, driven primarily by the sovereign debt uncertainty surrounding Greece, Spain and Italy, the forecast for countries outside the eurozone was less bleak. According to the panel, confidence is beginning to return to the US, where uncertainty over the euro has become the new norm. The panel also pointed towards an upbeat Asian market, where the troubles in the West are less pronounced. There is also likely to be a rise in outbound deals from emerging countries such as China, India and Brazil, driven by their growing demand for luxury products. "Whereas a few years ago it was the European and US companies acquiring Chinese businesses, now we are observing a reversal of this trend with some of these same Chinese companies, which were unsuccessful targets before, increasingly looking to expand their operations abroad," said Robin Jowitt. Jowitt also commented on the outlook for corporate restructuring. "I expect that private equity funds will make use of the increasing tendency of corporates to carve out segments of their business. In our [E&Y] studies these types of deals prove to be a high return transaction area for PE and will therefore be attractive future ventures." The panel insisted that a lack of finance was not to blame for the failure of recent big M&A deals, such as Prudential's attempted takeover of AIG, BHP Billiton's bid for PotashCorp, as well as AT&T's proposed takeover of T-Mobile. According to Giovanni Amodeo, the reason underlying the failure of some of these very large deals is that they lacked the potential to generate enough value for investors. In response to questions from the audience, the panel suggested that the recent changes to the UK takeover code had only a limited impact on M&A due to the lack of deal volume. Kilsby concluded the session with a muted upbeat forecast. 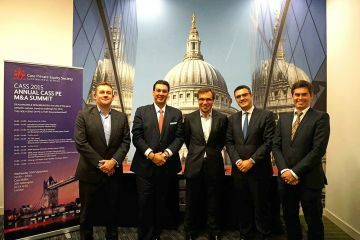 In association with the Cass Finance Society, the M&A Research Centre welcomed two directors from Credit Suisse's Investment Banking department on 1 December 2011 to give an insight into their jobs, the industry and real deals on which they have worked. Gregory Dalle and Thomas Vignon, Directors at Credit Suisse in the EMEA M&A and Financial Sponsors groups, respectively, introduced the audience to the Investment Banking industry and talked through real deals from the beginning (sourcing) to the end (execution). They also introduced their roles, working groups and what has made them successful in their careers. The event was followed by an opportunity to network with other guests. The aim of the conference was to provide delegates with exposure to one of the cornerstones of global finance by creating a space for dialogue and debate between leading dealmakers. As such, the guest speakers have in-depth experience in deal-making. The event began with opening remarks from Dean Richard Gillingwater, followed by a keynote speech from Bernard Liautaud, founder and former CEO of Business Objects (which was acquired in January 2008 by SAP for $6.8 billion, making it the third largest software acquisition at the time). This was followed by a panel debate hosted by Susan Kilsby, Chairman of M&A at Credit Suisse. This panel provided an overview of activity, valuations and sectors in global M&A, as well as future predictions. It also covered the importance of cross-border M&A and key territories for transactions. The final panel was chaired by Professor Scott Moeller, Director of MARC at Cass Business School. It considered deals where private equity is involved, comparing them to trade buyer-driven situations and examining different financing structures. Important aspects of M&A, such as valuation, legal issues and negotiating a successful deal were also addressed. Furthermore, the panel also addressed the latest developments in takeover regulation. Overall, the conference provided a thorough and up-to-date coverage of the M&A issues which are impacting deals in 2011, considering case studies and lessons learned from the recent past. 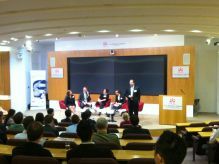 On 10 February 2011, an audience of senior M&A practitioners and students gathered at Cass Business School to discuss and debate the outlook for mergers and acquisitions in 2011. 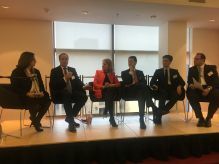 The event, organised by the M&A Research Centre (MARC) at Cass, featured a panel of representatives from MARC's senior sponsors, Credit Suisse and Ernst & Young, its sponsor, Mergermarket, and senior journalists. In the last quarter of 2010, it was reported that 'M&A mania' was gripping the world. Anyone with insight into the market would realise that was only in the context of the dramatic downturn of the previous two years. However, the first month of 2011 saw £209bn of deal activity, the best start to a year for a decade. So surely it's good times for M&A? Focus later turned to the changes in the Takeover Code proposed by the UK's Takeover Panel which in October 2010 published a consultation paper to which Cass has provided evidence. Stuart Upcraft, Head of UK M&A at Credit Suisse, and Professor Scott Moeller, Director of MARC, discussed some of the key reforms for takeover rules in the UK, which would have the effect of tilting the playing field of M&A back in the direction of target companies. These were not expected to have a major impact on the market in 2011, although they could affect the participation in the M&A market of financial sponsors, such as private equity firms. Roger Carr is a well respected deal maker, a self confessed free marketeer and vehement anti-protectionist but his world view was shaken when, as Chairman of Cadbury, he was on the other side of the fence, battling against a hostile takeover from US confectionery giant Kraft. Mr Carr now believes that a debate should be had over the UK's takeover code, and the designation of some UK businesses as takeover-proof 'strategic assets'. An audience of City grandees, academics and students gathered, by invitation of Cass's M&A Research Centre, to hear Mr Carr provide an intimate picture of the real story behind Kraft's bid for Cadbury. He first dispelled the myth of Cadbury being a British business, "far from being a national treasure the appetite for Cadbury shares in the UK was limited, the stock was simply not owned by a large number of mainstream UK institutions and its corporate reputation was fragile." At the start of last year Cadbury was on an upward curve having recovered from a long period of underperformance, so it did not need, nor would it have welcomed, a bid. It was a shock to the market, therefore, when in August 2009 Kraft launched its hostile takeover bid. The initial bid from Kraft sparked a 40% jump in Cadbury's share price which many shareholders took advantage of by selling stock, a large proportion of which was bought by short-term investors, such as hedge funds. Indeed 44 days after the initial bid, 31% of Cadbury was owned by these short-term investors who were motivated by the promise of a quick profit. The protracted timetable of the bid combined the threshold for the acceptance of takeovers specified in the UK Takeover Code helped Kraft's takeover, albeit at an impressive 50% premium on the value of Cadbury at the start of the bid and yielding the highest such premium in recent history in the UK. A tightening of the bid timetable to ensure that 'bear hug'-style bids are not permitted to unreasonably extend the 60 day bid timetable. A reduction in the level at which movements in shareholdings both direct and through derivatives have to be formally disclosed from the current level of 1% to 0.5%. This would provide greater transparency of a shift in the register whilst a bid is in progress. An increase in the acceptance level for takeovers to above 50% in order to minimise the risk that short-term shareholders would overwhelm the wishes of a committed longer-term shareholder base by simple majority. Mr Carr suggested that the history of foreign takeovers of British businesses, such as BAA, Corus, ICI and P&O, has highlighted the possibility of some firms to be considered 'strategic assets' making them effectively takeover proof, a practice common in countries such as France, Germany and Japan and the USA. In conclusion, Mr Carr said, "The UK is a huge earner from companies owned abroad and British companies have been as successful as predators as they have fallen as prey… If you are in government, you need to have a policy that defines strategic assets in advance, encourages stewardship with taxes and together with the Takeover Panel sets the rules. If you are in business, you must then live by them." Mr Kelly gave an informal and encouraging presentation to an audience of Cass students, staff and alumni on 28 January where he revealed strategic insights from his time at the company. The event provided attendees with the opportunity to hear first-hand about what made the merger of The Bank of New York and Mellon Financial such a success. The merger, which closed in July 2007, just weeks before the credit and liquidity crisis began, is continually applauded by the market. BNY Mellon is widely considered to be one of the strongest surviving banking groups globally. Mr Kelly explained that although the workforce was reduced by around 4,000 people or ten percent overall as a result of the merger, the business synergies produced have resulted in the organisation actually growing. He said the key to the merger's success was letting people know who their boss was early on in the process to minimise confusion, focusing on the culture of the new organisation and making sure employee engagement was strong; maintaining a disciplined turnover process which pitched the merger as one of equals and disallowing employees to refer to their old company by name, instead requiring them to preface the name with the word "legacy". Mr Kelly also said he was supportive of intervention into the banking industry saying there needed to be an ability to wind-down non-bank financial institutions, by taking over their financial holding companies and selling off their businesses without infecting the rest of the economy. He also gave encouragement to current students saying he graduated from an undergraduate business degree in the 1970s when the economy was also difficult. He said: "It is a tough environment, but recessions always end and people are always looking for good people. Whatever you decided to do try and do something you are excited about." Mr Kelly said those who enjoy their jobs perform better and, as life is short, you don't want to do something you don't like. 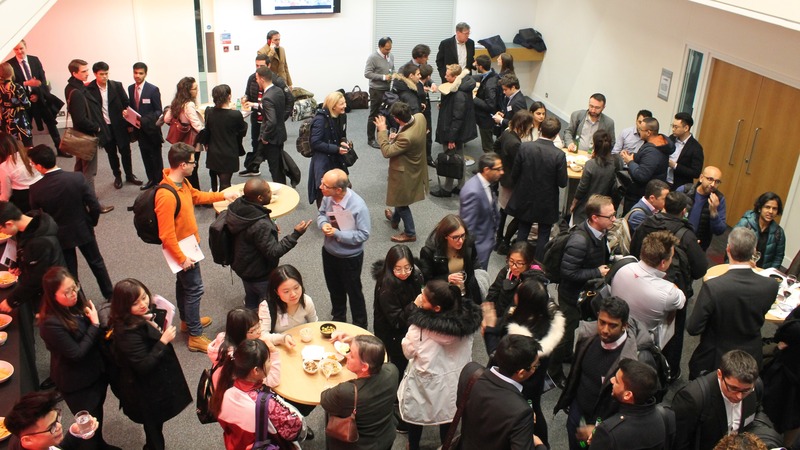 An audience of M&A industry practitioners and Cass faculty, alumni and students gathered at Cass recently to hear Alan Giles, Chairman of Fat Face, deliver the first in a new series of mergers and acquisitions workshops, sponsored by the M&A Research Centre at Cass Business School. In 2006, Alan Giles, then CEO of HMV Group, began negotiations for the takeover of Ottakar's, the main rival of HMV Group's own book store, Waterstone's. What was not clear at the start of the process was the unprecedented amount of coverage which this deal would cause from media attention to referral to the Competition Commission. From HMV Group's point of view, the acquisition of Ottakar's made perfect sense. "Both Ottakar's and Waterstone's had a similar operating philosophy and there were a number of obvious synergies", said Mr Giles. However, the merger of two of the leading bookstores in the UK was not warmly received by those in the publishing industry who saw their increased buying power and streamlined decision-making as a threat. This opposition led to the Competition Commission receiving 'an unusually high level of complaints' many of which cited a concern about the loss of Ottakar's 'distinctive book-buying experience'. After much deliberation the Competition Commission passed the merger with 'emphatic dismissal of all points raised'. Their main argument was that competition from supermarkets and the internet would mean that the newly merged company would have little scope to raise prices on bestsellers or other titles. Despite this, HMV Group had learnt a lot of lessons which they used to make changes across the Waterstone's chain, which included establishing localised customer service counters, re-designing their shop floors and improving their online offering. After his talk, the audience had the rare opportunity to ask Mr Giles about his long history as a Chairman, CEO and Marketing Director in the retail industry for several firms. He was also able to compare the corporate experience to his current work with the Office of Fair Trading, where he is a non-executive board member.